It was expected that we would discover a number of hominid species and that is now clarified here. Yet is is also worth recalling that unique geological circumstances have given us a window into the past that is generally missing most everywhere else. With three successful species in just this window the presumption is that all of Africa at least was well populated with primates. It has also been convincingly argued that humanity rising overran or inter married with all other primates besides themselves. Yet it is reasonable that those populations were never large at all. Small populations can survive by simple avoidance and specialization in a different biological niche. Thus we have come to understand the Sasquatch and its obvious relatives in Asia. Could a range of different small hominids also exist? So long as they stay out of our niche, it is certainly possible. If we have had difficulty in working with the Sasquatch, then this would be a much larger challenge and we have certainly had difficulty. It is not particularly obvious that small hominids would share our ecological niche and that is necessary for rising humanity to hunt them out into extinction. If we presume instead that they are skilled forest dwellers and nocturnal hunters as well ,then the chance for mutual contact approaches zero and general avoidance is easy. We do have cultural evidence that has been dismissed for centuries but still makes the point. They are always small and manlike. I have even posted on at least one conforming sighting. The fact that there is little in the fossil record also misstates the fossil record. There is far too little fossil record at all. We have almost nothing between the West African fossil window and now. All we really know is what was possible. ScienceDaily (Aug. 8, 2012) — Exciting new fossils discovered east of Lake Turkana confirm that there were two additional species of our genus -- Homo -- living alongside our direct human ancestral species,Homo erectus, almost two million years ago. The finds, announced in the scientific journal Nature on August 9th, include a face, a remarkably complete lower jaw, and part of a second lower jaw. They were uncovered between 2007 and 2009 by the Koobi Fora Research Project (KFRP), led by Meave and Louise Leakey. KFRP's fieldwork was facilitated by the Turkana Basin Institute (TBI), and supported by the National Geographic Society, which has funded the KFRP since 1968. Four decades ago, the KFRP discovered the enigmatic fossil known as KNM-ER 1470 (or "1470" for short). This skull, readily distinguished by its large brain size and long flat face, ignited a longstanding debate about just how many different species of early Homo lived alongside Homo erectus during the Pleistocene epoch. 1470's unusual morphology was attributed by some scientists to sexual differences and natural degrees of variation within a single species, whereas others interpreted the fossil as evidence of a separate species. This decades-old dilemma has endured for two reasons. First, comparisons with other fossils have been limited due to the fact that 1470's remains do not include its teeth or lower jaw. Second, no other fossil skull has mirrored 1470's flat and long face, leaving in doubt just how representative these characteristics are. The new fossils address both issues. 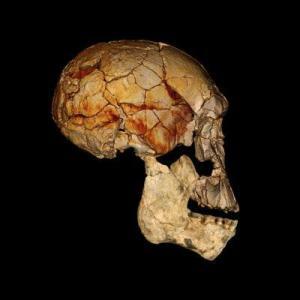 "For the past 40 years we have looked long and hard in the vast expanse of sediments around Lake Turkana for fossils that confirm the unique features of 1470's face and show us what its teeth and lower jaw would have looked like," says Meave Leakey, co-leader of the KFRP and a National Geographic Explorer-in-Residence. "At last we have some answers." "Combined, the three new fossils give a much clearer picture of what 1470 looked like," says Fred Spoor, leader of the scientific analyses. "As a result, it is now clear that two species of early Homo lived alongside Homo erectus. The new fossils will greatly help in unraveling how our branch of human evolution first emerged and flourished almost two million years ago." Found within a radius of just over 10 km from 1470's location, the three new fossils are dated between 1.78 million and 1.95 million years old. The face KNM-ER 62000, discovered by field crew member Elgite Lokorimudang in 2008, is very similar to that of 1470, showing that the latter is not a single "odd one out" individual. Moreover, the face's well-preserved upper jaw has almost all of its cheek teeth still in place, which for the first time makes it possible to infer the type of lower jaw that would have fitted 1470. A particularly good match can be found in the other two new fossils, the lower jaw KNM-ER 60000, found by Cyprian Nyete in 2009, and part of another lower jaw, KNM-ER 62003, found by Robert Moru in 2007. KNM-ER 60000 stands out as the most complete lower jaw of an early member of the genus Homo yet discovered. The team working on the new finds included Christopher Kiarie (TBI), who carried out the laboratory preparation of the fossils, Craig Feibel (Rutgers University), who studied the age of the fossils, and Susan Antón (New York University), Christopher Dean (UCL, University College London), Meave and Louise Leakey (TBI, Kenya; and Stony Brook University, New York) and Fred Spoor (Max Planck Institute for Evolutionary Anthropology, Leipzig and UCL), who analyzed the fossils. The National Geographic Society funded the fieldwork, the Leaky Foundation funded geological studies, and the Max Planck Society supported laboratory work.